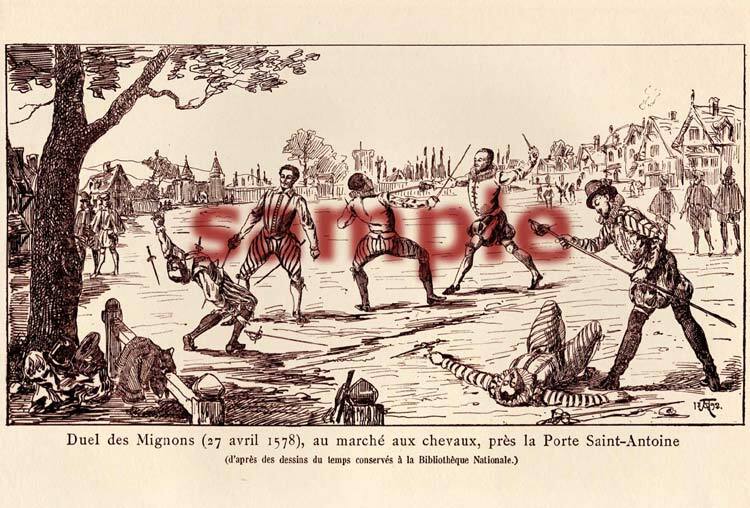 This 19th century engraving depicts one of the most famous duels in French history. Taking place on April 27, 1578 during the reign of Henri III and known as the Duel des Mignons, it was one of the instances where the savage nature inherent in armed combat manifests itself within the context of a duel. Mignon is a term meaning a favorite of the King. In this case two of Henri III Mignons, Quelus and d’Entraguet developed an animosity towards each other over their amorous interest in a lady. Maugiron and Livarot seconded Quelus, while his selected assistants Riberac and Schomberg seconded d'Entraguet. During this era it was the custom in an affair of honor for the seconds to join in the combat along with the two principles. In the furious rush of the combatants the seconds Riberac and Maugiron died of sword thrusts through the body. The other pair of seconds engaged with each other and Schomberg severely opened up the cheek of Livarot with a horrible cut. The latter, however, ran Schomberg through the chest and killed him instantly. The principles Quelus and Entraguet engaged with vigor, the former armed with a rapier and the latter with a rapier and dagger. In the first exchange Entraguet received a slight thrust to the arm and the hand of Quelus was severely mangled. As the fight progressed, Entraguet, in making use of the rapier and dagger, stabbed his adversary several times in the body and Quelus fell from exhaustion and loss of blood. On falling Quelus asked Entraguet to be satisfied and the combat stopped. However, some weeks later Quelus the King's favorite died of his wounds. Henri III was so angered and stricken with grief that he forbade all dueling in his realm on pain of death.